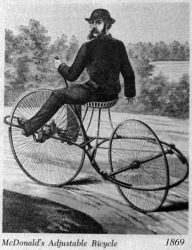 We tend to think of recumbents as a “new” type of bike, but as Solomon observed “there is no new thing under the sun.” The recumbent has been around, in one form or another, since before the turn of the 20th century. 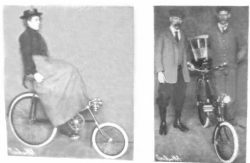 These pictures show that many features of “modern” recumbent design have been around quite a while too! “The Horizontal Bicyclette normale” – M. Challand, picture from “La Nature” October 1896. 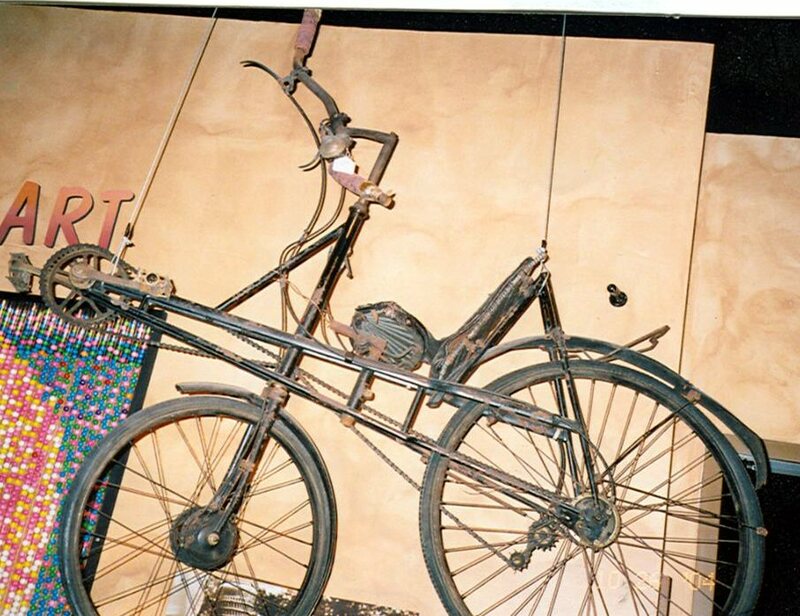 Exhibited in Geneva this innovative bike had horizontal pedaling to allow greater thrust on the pedals. The lower seat allowed easier mounting and improved stability. 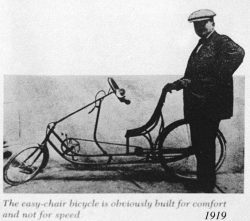 Commonly called the “Challand recumbent” nowadays, it never became popular, maybe because it weighed about three times as much as its rider! This bike is the first USS (Under Seat Steering) recumbent I know of. 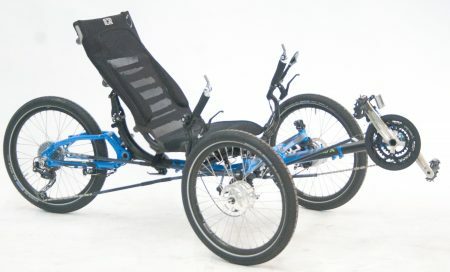 It may also be the first production recumbent, the customer ordered 12 more. Notice the rod steering linkage, still popular on USS recumbents. Notice also that the reviewer found it not only comfortable but also easy to control. 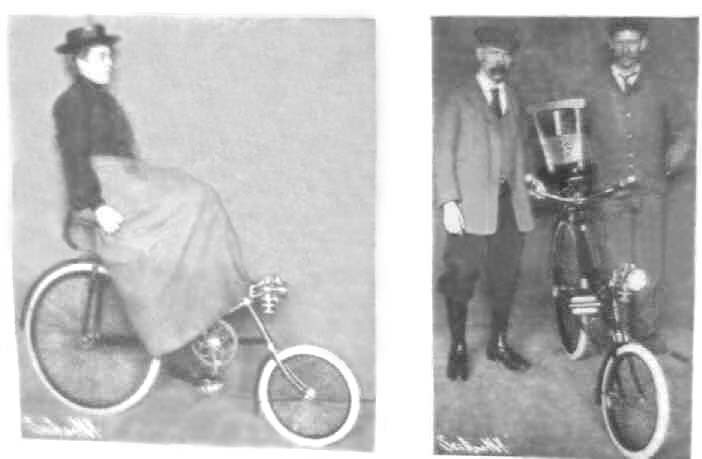 You can see that using a 26″ rear wheel on a CLWB (Compact Long Wheel-Base) bike raises the seat considerably. I wonder why the woman’s model was more popular. Can you imagine how they got on and off with the long skirt of the day? Here is another iteration of the “Recumbents are slow” error that pops up several times over the years. It seems that it was assumed that a comfy bike could not be fast, I’ve gotten similar comments form traditional road bike riders as I past them. As much was stated in 1919, see below. Check out the 1933 Velo car info which should have pretty much put that line of reasoning to rest. To bad it didn’t. 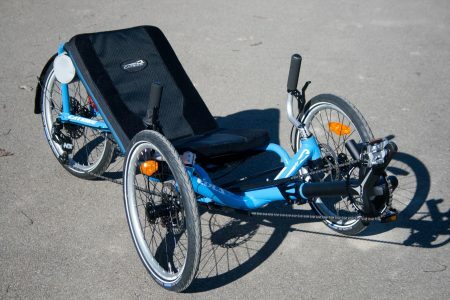 Doesn’t this SWB recumbent look remarkably modern? But then you probably would not notice if your typical 1890 upright bike passed you on the street. The “experts” of the day made the same mistake many people do today. They assumed that because a recumbent looks comfortable it must be slow. Fifteen years later, in 1934, it would be outlawed from racing by the UCI (though it doesn’t look like this gentleman would care.) That seat looks pretty comfortable, don’t you think? 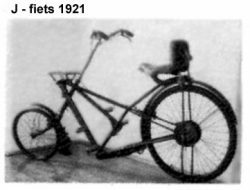 In 1919 it was noted that “the conventional bicycle has been made in much the same manner for years.” After another 80 years of refinements conventional bikes still haven’t changed much, have they? Should we blame it all on the UCI who kept recumbents from public view by banning them from their races? The more things change, the more they remain the same! In 1933 Francis Faure, a Frenchman, rode a recumbent 28 miles (45 km) in an hour, a new record. 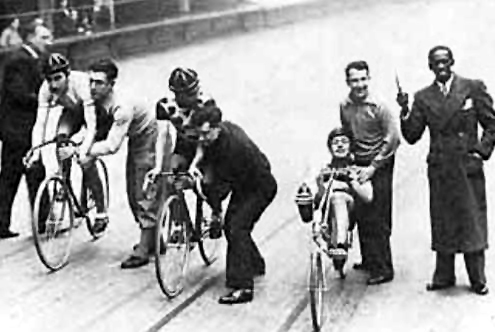 In 1934 the UCI (Union Cyclist International) outlawed recumbent bicycles, and has not relented to this day. 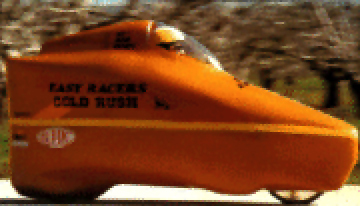 In 1938 Francois Faure rode the recumbent streamliner “velocar” 50.5 km/hour, another new record. Francesco Moser surpassed this mark on a wedgie. Moser rode 51.1 km/hour, but not till 1984, 46 years later! The most prestigious record was distance in one hour which stood at 44.247 km. 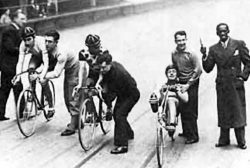 Oscar Egg, held the hour record at that time, which made his name a household word in France. 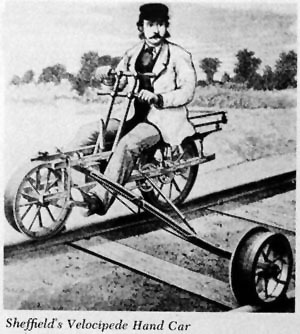 Along came the self-taught engineer, Charles Mochet. Charles had invented a four wheel pedal car that was gaining popularity It occurred to him that it would be lighter and faster with only two wheels. 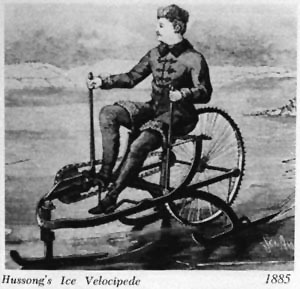 There is no evidence that he knew of the previous recumbent bikes, but he may have. He seems to have developed his two wheel design from the four wheeled pedal cars he manufactured. 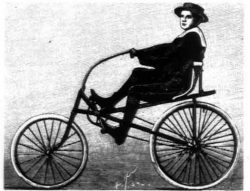 Named “Velocar” after his popular four wheel vehicle, his recumbent bike was ready to race in 1933. Mochet interested Francis Faure a French 43 year old “second rate racer” in the bike. 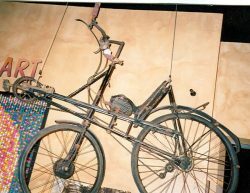 Faure hoped to set a new hour record on it. In 1933, Francois Faure, a Frenchman, rode a recumbent 49.99 km in an hour, a new record. The day of Faure’s hour attempt the other racers jeered at him and his bike. Stand up and pedal like a man they joked, lying down will make you sleepy. Their laughter died as he out paced two professional riders. 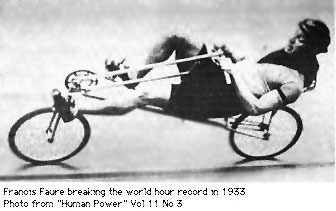 Faure went on to beat the world hour record, going 45.055 km in one hour. 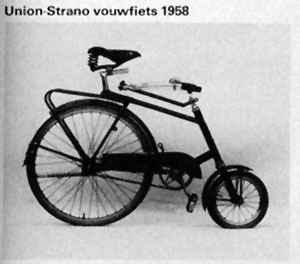 In 1934 the UCI (Union Cyclist International) ruled that the Velocar was not a bicycle and could not be raced in UCI events of for UCI records. Faure’s record was relegated to a foot note in cycling history with the stroke of their bureaucratic pen. 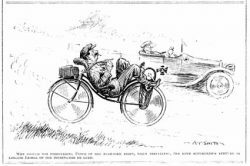 The recumbent was faster, and they didn’t want to have to compete with it. They have not relented to this day. 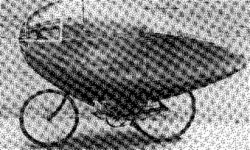 In 1938 Marcel Berthet rode a streamlined velocar 50.5 km/hour, another new record. Francesco Moser surpassed this mark on a wedgie. Moser rode 51.1 km/hour, but not till 1984, 46 years later! 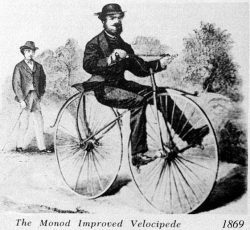 Without the UCI’s endorsement to race or have the record, Mochet’s recumbent never had a chance to become a mainstream item. 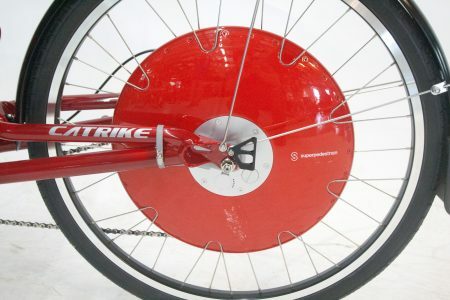 That is why recumbents have not been mass-produced until now. 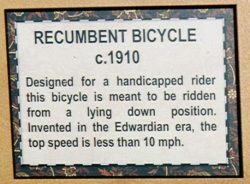 Who knows, if the UCI hadn’t banned recumbents from racing you could have been riding a recumbent years ago. The rest of this page is pretty jumbles, sorry. 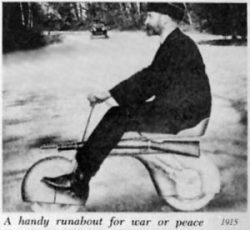 I would like to work on it more (especially USA recumbent history!) but that will probably wait till next winter. I include this prone-recumbent (if that isn’t an oxymoron) lest we think that horizontal means comfortable. I wouldn’t look forward to a century ride on this one. How well could you breathe on climbs? It does however have the advantage of a short chain line! 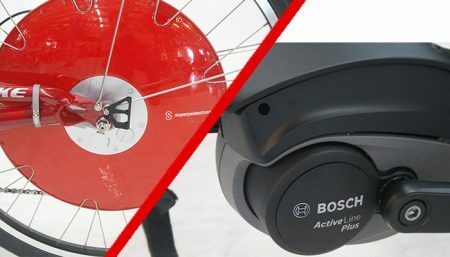 Windshield for cyclists with the aid of which Berthet has beaten some indoor records. There is a wedgie in that fairing. 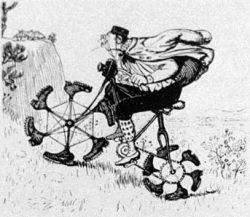 Berthet saw the advantage of aerodynamics long before he raced recumbents. The UCI wouldn’t allow either. 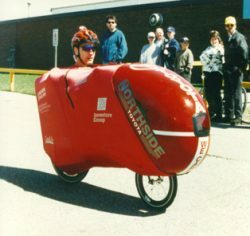 These are modern racing recumbents with fairings. They are all record holders. They show that aerodynamics is still the name of the game for top speeds.